This computer was partially compatible with the Texas Instuments TI 99/4A. It had almost the same characteristics, except its main CPU (TMS 9995 instead of the TMS 9900 for the TI 99/4A). The two languages (GBASIC and Tomy Basic) were only available in UK and US computers. 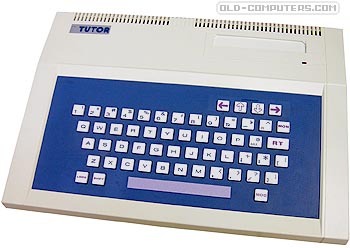 The Japanese computers didn't have the Tomy Basic (a TI-like Basic), but a "nihongo basic" using japanese characters and words, e.g. "kake" meant "print", "moshi-naraba" meant "if-then". This computer, known under the name Pyuuta in Japan had no really success outside Japan. It was followed by the Pyuuta Mark 2 and a game console called Pyuuta Jr one year later. see more Tomy Tutor / Pyuuta Ebay auctions !